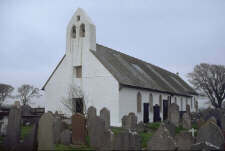 Parish dedicated to St Lua, Malew, probably once the most important parish as it includes Castle Rushen and the erstwhile Island capital Castletown whose churches are covered separately. 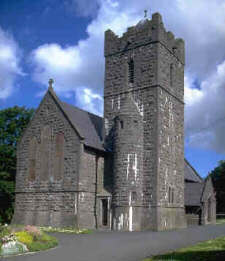 The parish also contains the remains of the once great Rushen Abbey. 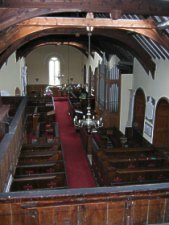 Looking down church from West Gallery - organ and pulpit on southside, north transept opposite organ. Probably the finest of the Parish Churches - being the Parish Church for Castletown, the one time capital, it contains a fine selection of memorials (mainly to the Goldie-Taubman's) and mostly 19th century stained glass. Some earlier church furniture has survived including a 12th century crucifix (replica mounted on wall) and medieval lantern. Intended to provide a more convenient Chapel of Ease together with a parish school for those from the outlying mountainous districts. Hugh Cosnahan (of Kew)and Thomas Fargher (of Shenvalley) appeared to be the instigators of the foundation. Consecrated 1772 by Bishop Mark Hildesley hence the dedication to St Mark though Kneen states that there was an ancient church near the site which was probably dedicated to St Mark as the fair was held around May 12th (Old style). It was the Rev John Thomas Clarke, vicar from 1827 to 1864, (sometime styled " Patriarch of St Marks") who did most to develop the parish. Built as a mission room, opened June 1898 and also licenced for Baptisms. Now converted into a private dwelling. Norse-Celtic, probably early 12th Century prior to establishment of insular parishes. 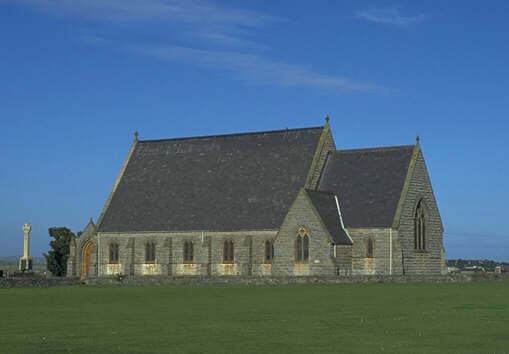 Roofless for at least 300 years, J.R. Bruce puts its good preservation to its situation on non-agricultural land and subsequent use as a burial ground by Roman Catholics during late 18th/early 19th Century. First mentioned in Chronicle of Man when a battle took place in 1250 at insula Sancti Michaelis, Blundell in c.1648 mentions 'a handsome church with a spire steeple' - the spire steeple being an exaggerated description of the bell-turret then a feature unusual in Manx Churches. Daniel King's vignette view of 1651 shows a roofless building with high gables with the western gable containing a bell turret. 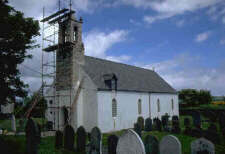 Some repairs, and a (in some aspects confusing) survey by Armitage Rigby, undertaken in 1907 when taken over by the Museum and Ancient Monuments Trustees; further repair work undertaken in 1928 when the bell cote was rather crudely rebuilt.